Today's post is all about Sizzix and Stampers Anonymous. First up is Sizzix! Tim had a brand new demo table to work on, so we needed a great backdrop for it. As you can imagine, it started out with just a big wood wall...so we brought a few props...lol. I think we used every show prop we have and then some (some from my house, some from his...) It turned out wonderful. It was the best the "demo table" area has ever looked! The samples were beautiful! 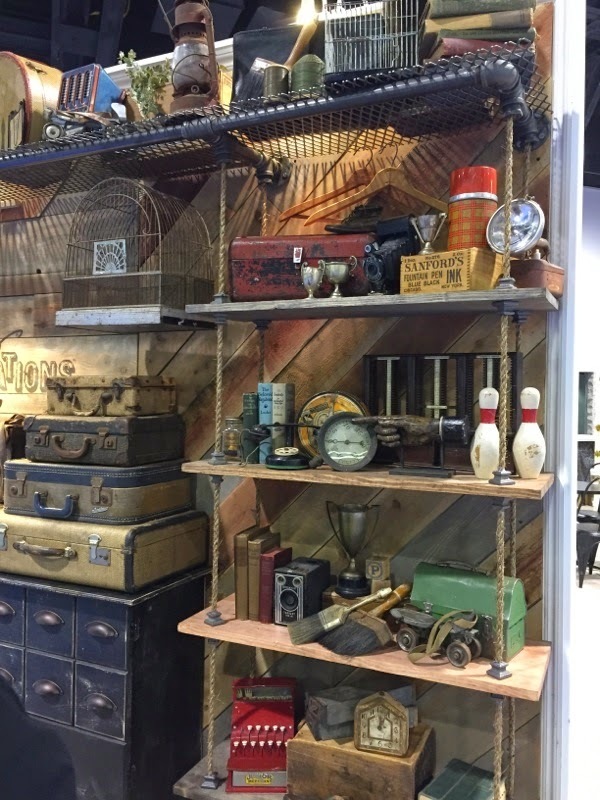 Even though there were multiple designers - Mou, Audrey, Tammy, Richele, Aida and Jan...the colors all worked really well together and made for a beautiful display. Tammy Tutterow- Tammy created a few samples for the booth, one of which was the darling Burlap Panel showcasing the new the Bird Silhouette Bigz die. The words are from the Handwritten series of Thinlit dies. 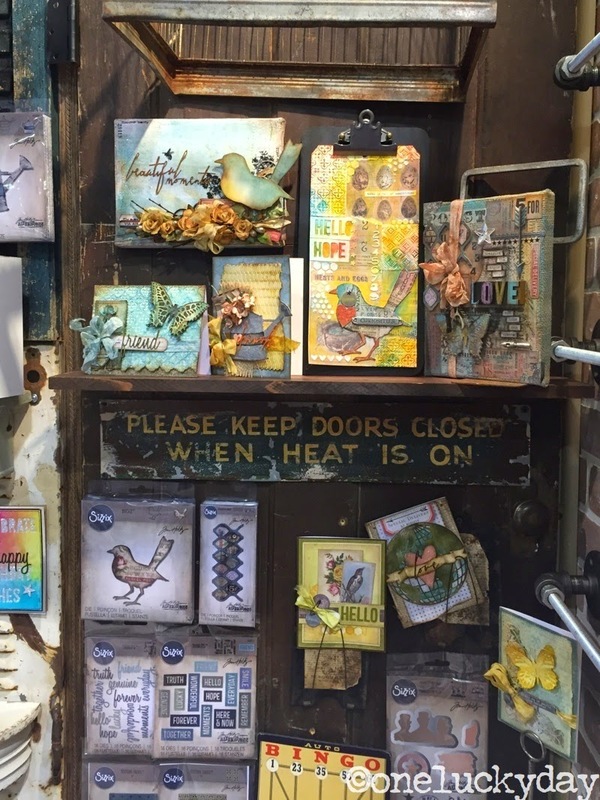 There is so much detail to Tammy's work, including layers of Remnant Rubs, Ephemera and handmade flowers that really make this an extraordinary piece. 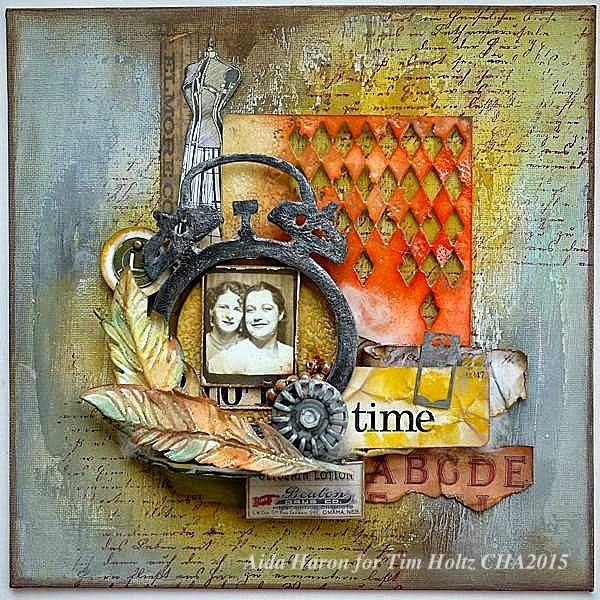 Aida Haron -Aida created two canvas panels using a combination of old and new dies. The orange harlequin background is part of a new Thinlit set called, Mixed Media and the feathers are from the new Bigz/texture fade combo called, Feather Duo. Be sure to click on the picture to see Aida's canvas larger because it was stunning in person. 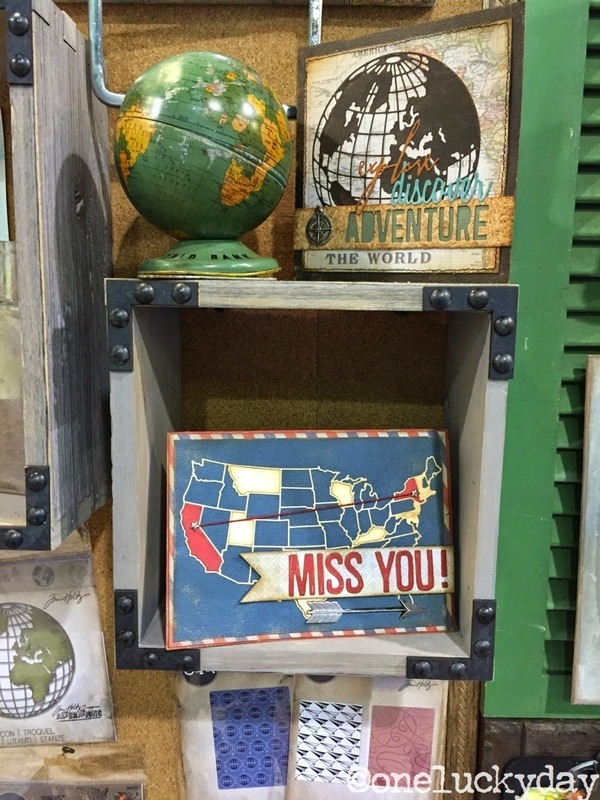 Richele Christensen - Richele created these cards using the new Globe and United States dies. I love the layering of words on the Adventure card. You might notice that the word Adventure is cut from cork (another surface in the Texture Pack)! The USA card is super cool with red string that runs from coast to coast. Clever! I love this group of projects by Mou Saha and Audrey Pettit that showcase more new travel dies; Mini Airplane and Clouds, Postage Dots and Adventure Words (as well as that fantastic globe again). Loving the spring like colors Mou and Audrey used to create these! Mou Saha - Throughout this review of projects you have probably noticed the large tags that were created by Mou Saha. Every single time I have worked with Mou over the past 5 years or so, I am always blown away by something she creates. Last year it was a series of Burlap panels using Found Relatives. This time it was this series of #12 tags. The pictures here do not do them justice. I don't know how she does it, but know I love it. Chelle Fowler - The majority of our Stampers Anonymous cards were made by the lovely Chelle Fowler. 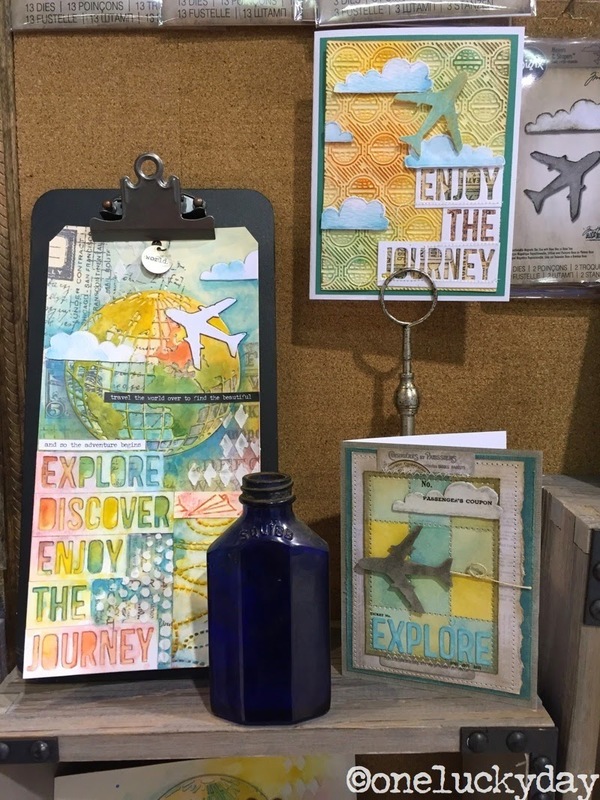 Chelle's coloring with Distress Markers and use of the stamps for layering is just stunning. I'm sharing my favorite card just because I love the bright pink flowers so much. She also used the Dots and Floral background stamps (on the teacups) that will be released mid February. 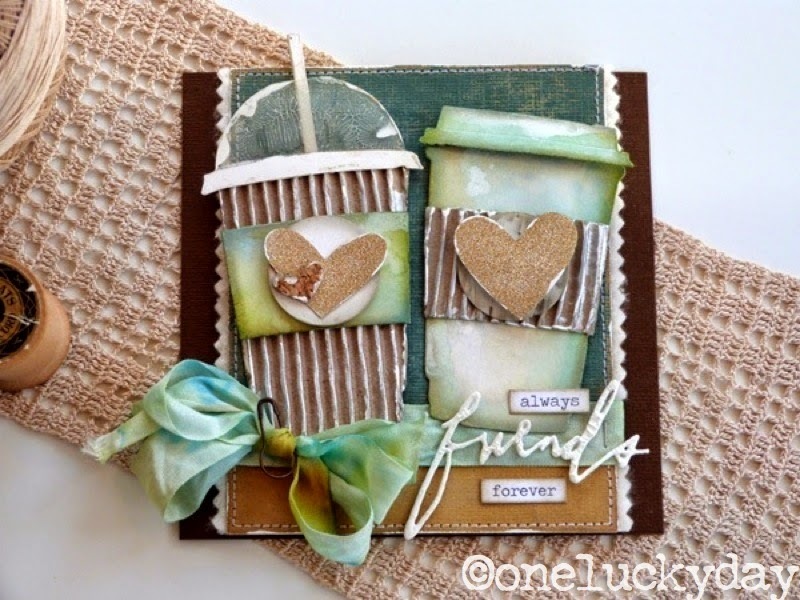 You can see more of Chelle's CHA cards on her blog, just click here. Another of my favorite cards from Chelle! The stamp set is called Bird Crazy. Super cute! Bobbi Smith - I loved this card by Bobbi that has the most perfect blue butterfly in the center. This is from a set called Perspective, that is out now. The background is Mesh and Linen, that stamp set ships in February. 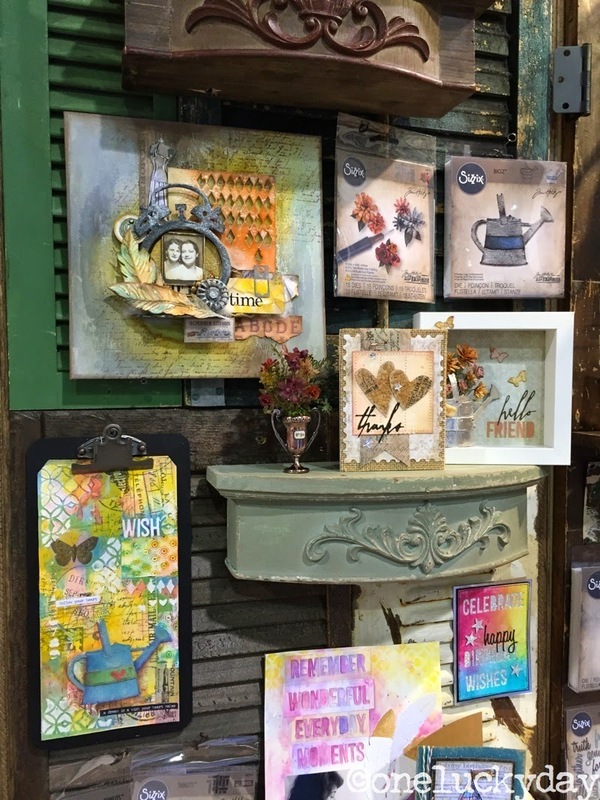 Well that is my favorite picks from the Sizzix and Stampers Anonymous. I hope you had a great time pin pointing some things that might interest you. I know I have some favorites already. I think my Distress Markers better get ready, they are going to be getting a workout! Wow, these samples are amazing! I better start a list of "gotta have" items. Bird Crazy is #1. Thank you for another great post Paula, such stunning creations!! I just love how Tim's products just work for so many different styles!!! All of them are just so inspirational, and thank you also for the links to some of the individual blogs! PS Hope we get to see some more of your own creations too!!! such wonderful samples! so inspired by these amazing designers!!! thank you for sharing!! The booth is fabulous! The samples are fabulous. Can not wait for the products to start hitting the stores. I'd have loved to see that booth in person. I'm in awe! And the samples are gorgeous - such talent! I can't wait to see the new products - all of them! Oh, loving all the reviews... seeing up close; so many awesome samples ... I'm in my HAPPY PLACE !!! fabulous samples! Funny I was not sure that I liked those funky birds but now I am in love with them! Thanks for sharing all the wonderful creations - can't wait to get the new products in my grungy little fingers!!! These are all gorgeous projects! I love all the use of color!! Beautiful projects! Everyone is so talented! I love the owls! Tim's demo table looks amazing and you're killing me with all that gorgeous artwork! Can't wait to get my hands on all those fun new stamps and dies! Now that I've copied & saved these amazing samples, next up to print them & get started! So excited for my SSS which will ship soon. You're exceptionally extraordinary!!! Beautiful projects Paula! Everyone's artwork looks amazing! Thanks for sharing! The booth looks incredible in the photos, so I can only assume that it looked stupendously wonderful in real life. And the samples - wow! Every one is gorgeous. 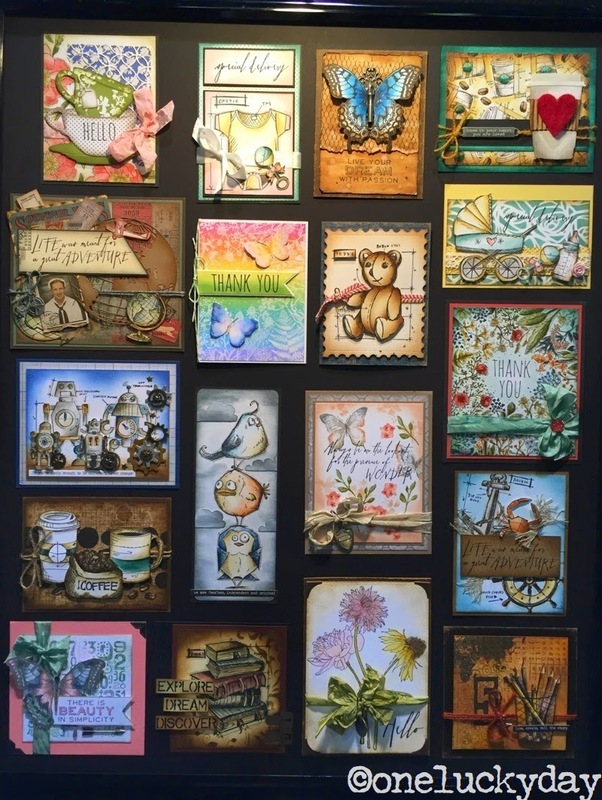 Top of my want list at the moment is the Bird Crazy stamp set & the Silhouette Bird Bigz die, I just love them. Lovely picks, and yay for getting your Distress Markers ready!!!! The samples are all bright and happy, they are all great. There are some Sizzix that I'm going to need, I see. These are amazing! I cannot stop looking at them! So inspiring! Thanks for sharing the details! You all worked so hard to get everything ready for the show and the results are just amazing! Love seeing all the details. That strap-on roller skate provided a big time childhood flashback (if only we could go back) and that's why your vintage booths give me so much pleasure. I also appreciate the beautiful samples and I really like the new "big flower" stamps. The way Chelle used them in the background of her tea cup card is really pretty. That canvas by Aida just grabs me. I love the orange on it. Such a huge departure from her typical pastels. All of them are just wonderful. Love seeing the samples and am really looking forward to seeing the new dies in the stores soon! 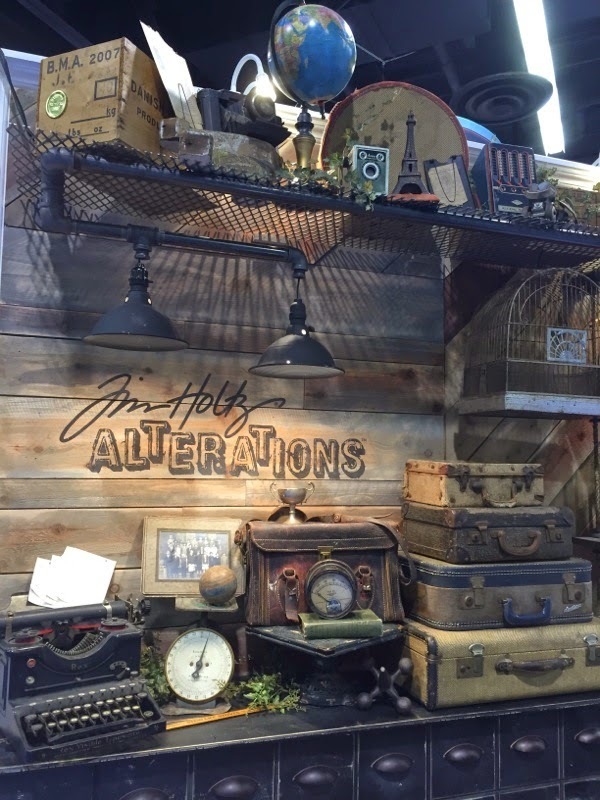 Paula, This is a great post and I love browsing here to see the booths and projects. I am hoping the birds will roost here as soon as I can order! Ooo Paula, I so wish to be there! It looks amazing and I am really pleased you sharing all this with us, thank you!